Vladimir Monomakh submarine of the Project 955 Borey class arrived in Vilyuchinsk after completing a transfer from the Norther Fleet. The submarine left Severomorsk in mid-August. In Vilyuchinsk, Vladimir Monomakh joins another Project 955 submarine, Alexander Nevskiy, which arrived there in September 2015, and older Project 667BDR/Delta III submarines, which are still active despite their old age. 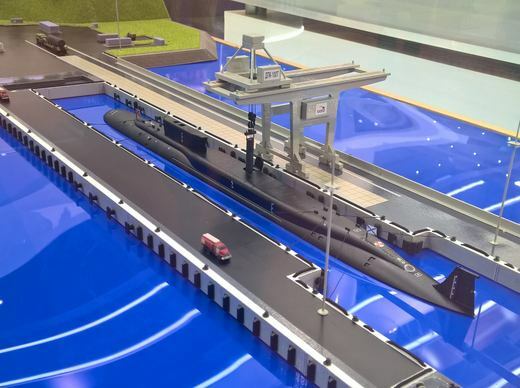 Vilyuchinsk is expected to become the primary base for Project 955 submarines. The lead ship of this class, Yuri Dolgorukiy, will probably stay with the Northern Fleet, but other submarines will be transferred to the Pacific. In anticipation of their arrival, Russia is building new missile loading pier (shown above on an image from the Army-2016 exhibit taken by Mikhail Zherdev) as well as new weapon storage site, described by Hans Kristensen. It's still under construction there. Is there a way to know the date of Yandex images? UPDATE: Based on Terraserver, the Yandex image is from this summer. So, the construction is not quite completed yet. The photo No.1 on the Spetsstroy website is dated in EXIF on September 14, 2016. I'm curious why it's taking that long. It was announced maybe ten years ago that Project 955 will be based in Vilyuchinsk.